On 2 May 1641, William married Mary, Princess Royal, who was the eldest daughter of King Charles I of England, in the Chapel Royal of Whitehall Palace in London. William was fifteen, while Mary was just nine at that time. In 1647, his father Frederick Henry died, and William II succeeded to both his hereditary titles and his elective offices as stadtholder of five of the seven provinces: Holland, Zeeland, Utrecht, Guelders and Overijssel. The Netherlands at this time was engaged in the Eighty Years' War against Spain for its independence. Under Frederick Henry, the Netherlands had largely won the war, and since 1646 had been negotiating with Spain on the terms for ending it. The Eighty Years' War or Dutch War of Independence (1568–1648) was a revolt of the Seventeen Provinces of what are today the Netherlands, Belgium, and Luxembourg against Philip II of Spain, the sovereign of the Habsburg Netherlands. After the initial stages, Philip II deployed his armies and regained control over most of the rebelling provinces. Under the leadership of the exiled William the Silent, the northern provinces continued their resistance. They eventually were able to oust the Habsburg armies, and in 1581 they established the Republic of the Seven United Netherlands. The war continued in other areas, although the heartland of the republic was no longer threatened; this included the beginnings of the Dutch Colonial Empire, which at the time were conceived as carrying overseas the war with Spain. 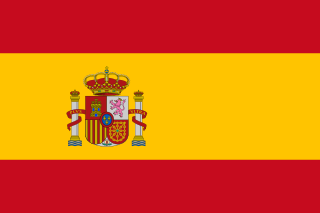 The Dutch Republic was recognized by Spain and the major European powers in 1609 at the start of the Twelve Years' Truce. Hostilities broke out again around 1619, as part of the broader Thirty Years' War. An end was reached in 1648 with the Peace of Münster, when the Dutch Republic was definitively recognised as an independent country no longer part of the Holy Roman Empire. The Peace of Münster is sometimes considered the beginning of the Dutch Golden Age. 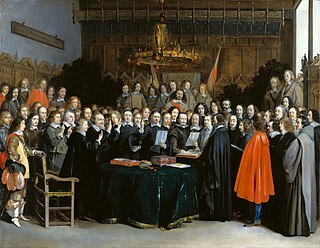 The negotiators agreed to the Peace of Münster in 1648, but William opposed acceptance of the treaty, even though it recognized the independence of the (northern) Netherlands, because it left the southern Netherlands in the hands of the Spanish monarchy. A separate peace furthermore violated the alliance with France formed in 1635. However, the States of six provinces voted to accept it. Double portrait to commemorate the bethrothal of William and Mary Henrietta Stuart, by Anthony van Dyck. William II of Orange and Mary Stuart, Princess Royal. In Dutch history, the year 1672 was known as the rampjaar, the "disaster year." 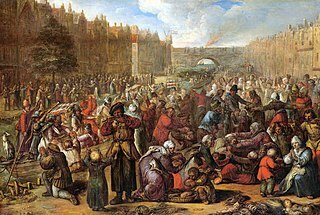 That year, following the outbreak of the Franco-Dutch War and the Third Anglo-Dutch War, the Dutch Republic was simultaneously attacked by England, France, and the prince-bishops Bernhard von Galen, bishop of Münster, and Maximilian Henry of Bavaria, archbishop of Cologne. The invading armies quickly defeated most of the Dutch States Army and conquered part of the Republic. Cornelis de Graeff, also Cornelis de Graeff van (Zuid-)Polsbroek was the most illustrious member of the De Graeff family. He was a mayor of Amsterdam from the Dutch Golden Age and a powerful Amsterdam regent after the sudden death of stadholder William II of Orange. Like his father Jacob Dircksz de Graeff, he opposed the house of Orange, and was the moderate successor to the republican Andries Bicker. In the mid 17th century he controlled the city's finances and politics and, in close cooperation with his brother Andries de Graeff and their nephew Johan de Witt, the Netherlands political system. Jan Gerritsz. Bicker (1591–1653) was a merchant, a mayor (burgomaster) and a member of the Bicker family, an influential patrician family from Amsterdam. Marquis of Veere and Flushing is one of the titles of the kings and queens of the Netherlands. 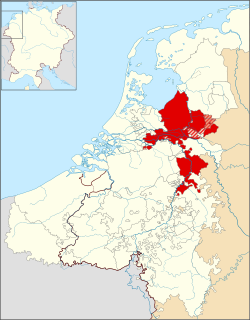 It was originally a Dutch title of nobility referring to the cities of Veere and Vlissingen, in the southwestern Netherlands. Holy Roman Emperor Charles V created the title in 1555 for his distant relative, Maximilian of Burgundy, who had by then ruled as Lord of Veere. After being held by the kings of Spain and England and claimed by the kings in Prussia, it definitively passed to the House of Orange-Nassau. The Attack on Amsterdam in July 1650 was part of a planned coup d'état by stadtholder William II, Prince of Orange to break the power of the regenten in the Dutch Republic, especially the County of Holland. 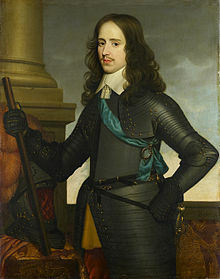 The coup failed, because the army of the Frisian stadtholder William Frederick, Prince of Nassau-Dietz got lost on the way to Amsterdam in the rainy night of 29 to 30 July. It was discovered, and once the city had been warned, it had enough time to prepare for an attack. The attempted coup made the House of Orange extremely unpopular for a lengthy period of time, and was one of the main reasons for the origins of the First Stadtholderless Period (1650–1672). Herbert H. Rowen, "John de Witt, Grand Pensionary of Holland, 1625-1672". Princeton, N.J.: Princeton University Press, 1978. Herbert H. Rowen, "John de Witt: Statesman of the "True Freedom"". Cambridge University Press, 2003. Pieter Geyl, "Orange and Stuart, 1641-1672". Scribner, 1970. Wikimedia Commons has media related to William II, Prince of Orange .